In the 1950’s, thousands of displaced people, or people displaced by the trauma of World War II, especially from Eastern Europe, found a new life in America. Many of them were Russian Orthodox people, who had suffered deprivation of their age-old culture, especially of their faith, under communism, and now found themselves in a very strange culture. It was not long before so many of them found their spiritual home in the Holy Trinity Monastery in Jordanville, New York. As these immigrants began to establish themselves in jobs and in many of the aspects of typical American life, their clergy, including the fathers of the monastery, sought ways to keep them within the faith. Many Russian Orthodox devotional and cultural organizations were founded. The monastery, early on, realized that the Labor Day weekend, at the end of the warm North American summer, provided an excellent opportunity to provide a spiritual feast for their pilgrims, and so the Solemnity of the Venerable Job of Pochaev weekend took shape. The feast of the Uncovering of the Relics of St. Job was close to the weekend, and the weekend almost always falls within the afterfeast of the Dormition of the Theotokos. For this reason also, this celebration took shape as an opportunity to distract the faithful from the worldly and sometimes not very edifying goings-on of Labor Day weekend. In the early days, thousands would gather in the monastery, as this was the perfect opportunity to renew acquaintenances made during the war in DP camps. As time went on, fewer and fewer took advantage of this celebration as people more and more assimilated into American life, although the pious continued and still do to this day gather in the monastery for this church holy day weekend. The last couple of years, through the efforts of the Very Rev. Archpriest Sergei Lukianov, pilgrimages have been organized to the monastery on this weekend, with hundreds coming from the New York and New Jersey area. Also, the PaTram musical class organization has held their annual session in the monastery during this time. This weekend, as so many years before, at 3PM on Saturday, a procession walked silently up to the monastery chapel of the Dormition of the Theotokos and the Royal Martyrs of Russia, to greet and return the monastery copy of the Pochaev Icon of the Mother of God, which was placed on the altar on the feast of the Dormition, to the cathedral. The faithful walked under the icon as a blessing and proceeded to walk down to the Holy Trinity cathedral of the monastery as the bells of the monastery rang out in joy. At the doors of the cathedral, Bishop Jerome met the icon and blessed the faithful with it. Thereupon a moleben to the Mother of God and St. Job commenced with an akathist hymn to St. Job. In the evening, the usual All-Night Vigil was served with the addition of certain hymns in honor of St. Job. During the Litya, the faithful processed around the church, stopping at the four corners for special petitions. Sunday morning, an early liturgy was served in the basement church of St. Job, whereas at 9AM, in the cathedral, Vladyka Jerome was greeted at the front of the church by the monastic clergy as well as a number of visiting clergy for the pontifical liturgy. The monastery choir was joined in singing the liturgy by the people who had assembled in the monastery under the auspices of PaTram. In his sermon, Vladyka Jerome spoke of the missionary work of St. Job and how we all should be missionaries among the heterodox. Three chalices were used to commune the faithful, who had in great numbers prepared themselves for this occasion, by confessing their sins the night before and attending the long monastery services. At the end of the liturgy, a moleben was served in the cathedral. After the kissing of the Cross, the faithful joined the brotherhood in the traditional meal of macaroni salad, buckwheat kasha, borscht and monastery bread, which was also available for sale. During the weekend, the bookstore was open for the convenience of the pilgrims as well as the Seminary Museum. On Sunday afternoon, at 4PM Vespers and Matins were served as is usual, and many pilgrims, taking advantage of the civil holiday, availed themselves of another day of prayer and preparation for another festal liturgy on Monday, this time, served by Metropolitan Jonah. After the evening meal, many pilgrims attended the service of Small Compline with evening prayers. At 8AM, again the clergy gathered for the traditional greeting of the bishop, this time, Metropolitan Jonah. Once again, the PaTram choir school sang intermittently with the monastery choir. It must be said that even though the monastery is not accustomed to mixed choirs, the PaTram group blended very well as they sang music based on traditional chants, thus embellishing the services. Thus ended one more Labor Day weekend pilgrimage. 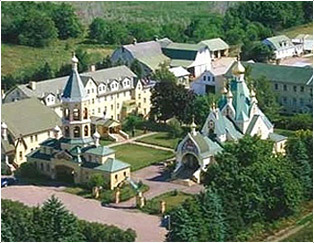 It is thought that the many pilgrims who arrived to the monastery rested spiritually from their worldly trials and tribulations and were refreshed with not only the pure air of the Herkimer County highlands, but also the grace-filled atmosphere of the monastery, whose heavenly protector St. Job is considered to be, and whose Pochaev monastery is considered to be the source of so many of our traditions and our missionary outreach, continuously from our foundation and God willing, until the end of time.